The installation of outdoor banners on lamp posts or on the sides of buildings is a great way to create a sense of place, advertise an event, or display a creative vision to enhance a public space. Whatever your intentions, the selection of the proper materials, the proper imaging process and understanding program longevity will ensure any project’s success. The information below is provided to guide prospective buyers with a solution that meets their expectations and understand the value of different substrates and print processes. Traditionally known as Sunbrella Banners, this 9 oz. fabric is adopted from the marine and awning industry and typically comes with a warranty of up to ten years from the manufacturer. The fabric is solution dyed, meaning the threads are dyed before weaving the fabric making the fabric color vibrant and resistant to outdoor fade. With that said, the imaging that is printed on the light pole banner is applied with ink systems via different types of print methods and while the fabric may last for 10 years, it is likely that the image on the banner will degrade over time. We have many installations that have survived the ten year test and exceeded our own expectations, yet it is a safe bet to consider a 3-5 year lifespan to be acceptable. Proper installation and rotating the banners with alternative displays will always increase the longevity of the product. 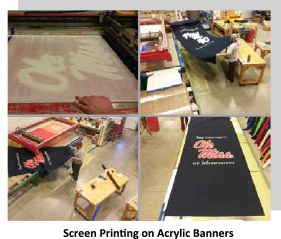 Screen printing is a common method of applying images to the acrylic fabric. A traditional craft using squeegees to push ink through a silkscreen. The fabric is printed with a UV resistant outdoor ink and heat-cured in a conveyor dryer at 400 degrees. Pros: Longevity. These banners have staying power in all types of weather when installed properly and routinely checked for looseness and adjusted accordingly. With a ten year fabric and a five year outdoor ink (on many colors) you will have a long-term, elegant outdoor fabric display. Cons: Designs are limited to spot color graphics with gradients. A solid color background (fabric color) is selected and solid color imprints are applied. Additionally, the cost of these banners is high on smaller quantities and increases with the number of colors used in the design. The process has some hefty set-up fees that need to be spread over the total number of light pole banners. Dye-Sub printing is newer technology where a natural color acrylic fabric is us ed and dyes are applied directly to the fabric and absorbed into the weave. The inks currently in use can last up to 3 years outdoors and have a high UV resistance grade. This print process has evolved drastically in just a few short years. Pros: The sky is the limit on design. Whether it’s photographic or contains multiple colors, the price point is “one size fits all” as the fabric is dyed with all colors in unison. The colors are dense and vibrant and the final product is elegant and eye-catching. There are no set up costs, making even a small quantity available at a reasonable price. Cons: Pricing on larger quantities can be higher than screen printing at larger quantities. Polyester reinforced vinyl comes in various thicknesses referred to as “ounces” which pertains to the weight of the vinyl cut at 1 square meter. 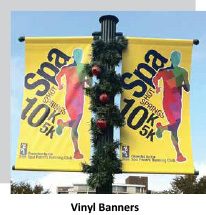 Vinyl banners are a great way to install a temporary display outdoors (6-12 months) to advertise an event or display a seasonal graphic during the holidays. 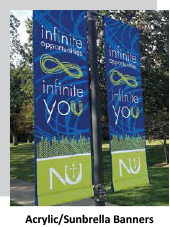 Proper street pole banner installation will increase the lifespan, especially in windy climates. Digital printing is just like sending a document to your office printer except our printers are industrial equipment that can handle wide format materials. The inks used are UV rated for outdoors and the images are vibrant. Pros: Lifespan is short but the cost is low. Great option for temporary holiday banners or a dated event. 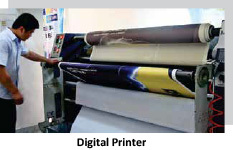 6-12 months is expected for the life of a vinyl banner with continuous use. Cons: Vinyl pole banners can appear to look more like advertisements than their fabric counterparts. If you’re looking for a more permanent display, an acrylic banner is recommended. As you can see, the look and feel of any custom banner program needs to be balanced with budget and creative insight. One guarantee that Project Graphics can offer is that the suitability of our processes, screen print, dye-sublimation or digital print will guarantee the desired results. For a consultation on a new banner program or if you have any questions please give us a call at 800-655-7311.